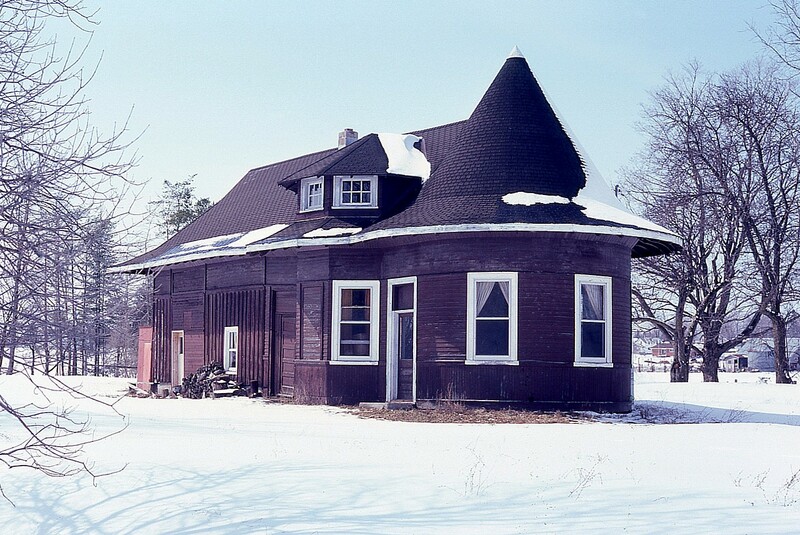 Railpictures.ca - A.W.Mooney Photo: This old station was part of the London, Huron & Bruce railway, which ran from London thru to Wingham. The line north of Clinton was in later years no longer profitable and the last train ran over it Apr. 26, 1941. The station was purchased by a town resident just for the nostalgia of it; and at one time it looked far worse than this image shows, after a nice coat of paint freshened it up. Eventually it was bought for a permanent residence, renovated with brick added as well; and became a Bed and Breakfast. This “witches hat” station is a real treasure from the past. | Railpictures.ca – Canadian Railway Photography – photographie ferroviaire Canadienne. Caption: This old station was part of the London, Huron & Bruce railway, which ran from London thru to Wingham. The line north of Clinton was in later years no longer profitable and the last train ran over it Apr. 26, 1941. The station was purchased by a town resident just for the nostalgia of it; and at one time it looked far worse than this image shows, after a nice coat of paint freshened it up. Eventually it was bought for a permanent residence, renovated with brick added as well; and became a Bed and Breakfast. This "witches hat" station is a real treasure from the past.